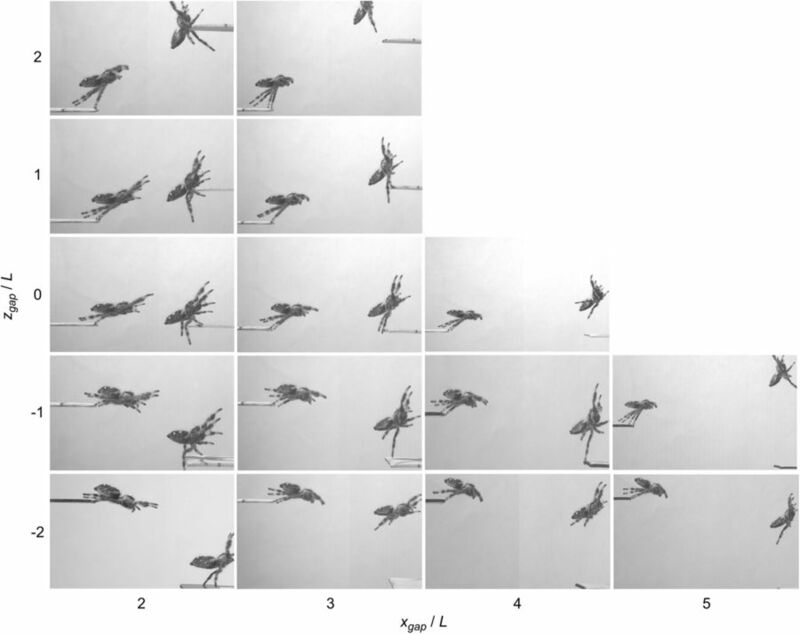 Against all common sense, a group of scientists trained a spider to jump on command. And if that wasn’t terrifying enough, they plan to use whatever they learn to build a bunch of tiny, jumping robot spiders. Jumping robots — from fleas and grasshoppers to small, lemur-like mammals known as bush babies — already exist. The last one can do parkour and jump off walls. NASA even wants to send robot bees to Mars. But scientists at the University of Manchester weren’t convinced any of those can move like their pet regal jumping spider, Kim, can. After seeing what Kim can do, the scientists want to build robots that jump just as accurately, according to a new paper, published in the journal Nature on Tuesday. The scientists set up two tiny platforms for Kim to jump between and kept adjusting them to see how far Kim could go. Right before she jumps, she sets down a thin silk safety line to her platform, which helps keep her stable. The scientists then used a mini computerized tomography (CT) scan to make highly-detailed (and highly creepy) 3D renderings of Kim. To add to the nightmares, they also set up high-speed cameras to film her jump. And for scientific reasons that remain unclear, they played that video back in slow motion, set to some electronic music. Still, the researchers appear to be in awe of what they found which is maybe more off-putting than the jumping spider itself. “The force on the legs at take-off can be up to five times the weight of the spider,” Nawaby continued. “This is amazing, and if we can understand these biomechanics we can apply them to other areas of research.” He means robots. Beyond understanding the anatomy of this particular spider, it’s the “agile micro-robots,” as the University’s press release puts it, that the researchers are ultimately after. Kim, along with a bunch of other types of jumping spiders, use hydraulic pressure — basically pumping blood into their legs at high pressure — to shoot them backward hard and fast. In this study, however, the researchers think Kim made her jumps using muscle strength alone. And if the prospect of tiny, mechanical spiders jumping at you wasn’t enough terrifying tech news for your Wednesday, Google Assistant just successfully placed a phone call. The AI-powered feature made an appointment for a haircut for someone named Lisa.